It was inevitable that a young George Murray, born into a long established Perthshire family with both Jacobite and Hanoverian loyalties, would soon see action in the campaigns against Revolutionary France and Napoleon Bonaparte after obtaining his commission into 3rd Regiment of Foot Guards (the Scots Guards) in 1790. Murray served with distinction in the Low Countries, which were seen as essential to safeguarding Britain’s trade links and in Ireland, where the constant threat of insurrection and invasion required a huge garrison. He accompanied General Abercromby to remove the French from Egypt, where Murray was in the first wave of the landing force at Aboukir, one of the great British military successes. Becoming one of the new ‘Scientific’ officers, Murray was the brains behind the plans to take a number of West Indian islands from the French, before settling into his career in the Quartermaster General’s department. He made a name for himself in the controversial bombardment of Copenhagen in 1807, which resulted in the capture of the entire Danish fleet, the first operation in which Murray and Arthur Wellesley (later the Duke of Wellington) fought together. Sent to Sweden on a delicate diplomatic mission to negotiate with the unstable Swedish King, in support of General Sir John Moore, by now he had earned the confidence of the British Government, as well as his military superiors. On return from Sweden, Murray found himself sailing to Portugal and into the midst of a debacle, culminating in his drafting the highly contentious Convention of Cintra. He was becoming acutely aware of the personal weaknesses of the men who carried Britain’s expectations on their shoulders, including Wellington, and recognised his potential role alongside them. Remaining in Portugal, and now serving again with Moore, he planned the advance into Spain, and the dispiriting, and brutal, retreat to Corunna, losing his good friends Moore and Anstruther in the last days of the campaign. A few weeks after his return to England in 1809 he was appointed Wellesley’s QMG, again in the Peninsula, and would, from that moment, work closely (if not always in agreement) with Wellesley in the successful actions that followed, including Oporto, Talavera and Busaco. He was one of only an handful who knew of the building of the massive Lines of Torres Vedras. Frustrated by the attitude of Spanish and Portuguese allies, and the slowness of his promotion prospects, he returned home on leave in early 1812, perhaps with marriage in mind, and shortly thereafter resigned his position with Wellington’s army, moving again to Ireland. Begged by Wellington to return, he played a major role in moving the army across Spain in 1813 and orchestrating the major battles that saw the French driven back over the Pyrenees. Under his leadership, the role of the QMG department expanded enormously, and Murray became Wellington’s most trusted staff officer. Sent to Canada to take command there in the dying days of the War of 1812, and becoming, temporarily, Governor General, he again answered the Government’s and Wellington’s calls to return to face Napoleon after his escape from Elba, but arrived too late for Waterloo. For three years he was Chief of Staff to the multi-national force occupying France. There he had an affair with Lady Louisa Erskine (sister of Henry Paget, Wellington’s cavalry commander who lost a leg at Waterloo), which was to lead to her divorce, an illegitimate daughter, marriage, and long lasting social difficulties for them both. Murray served as Governor of RMC Sandhurst and Commander in Chief in Ireland. Following his election as MP for Perthshire, Wellington appointed him Secretary of State for War and the Colonies in his Government, resulting in the Murray River and Perth, Western Australia being named in his honour. An unhappy period in his life, Murray persevered with his political career until appointed Master General of the Ordnance in Peel’s administration, a post he held until his death in 1846. 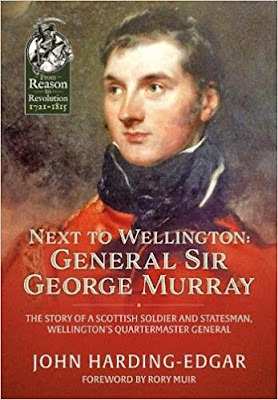 Based on primary sources, in particular Murray’s own papers and letters, the book delves beneath the surface of many of the major military and political events of the time, and examines the very close military, political, and personal relationship that bound Murray and Wellington together, as, with demonstrable mutual loyalty and respect, they confronted enemies and opponents over a period of 40 years during an extraordinary period of British history.